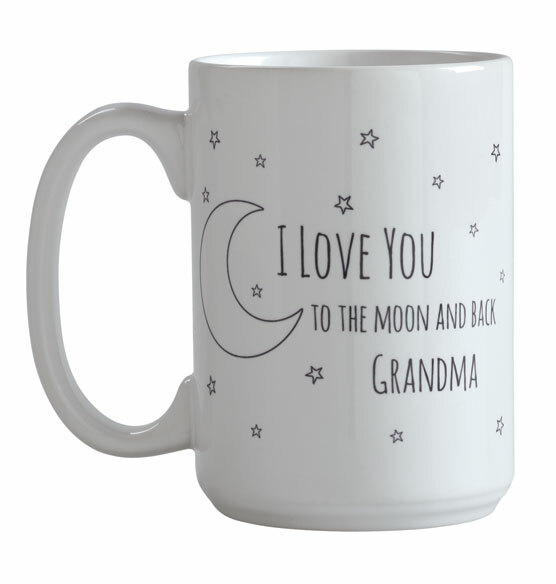 The sweetest of sentiments adorns this personalized To The Moon mug. Add the name of a loved one to create a gift that will warm their hearts each time they reach for it. Perfect for grandparents and other special people. The personalized mug's design wraps around both sides of the mug, with no break in the star design. So would the personalization go in the place where it says "Grandma?" BEST ANSWER: Thank you for your question. Yes, "Grandma" is just an example in this picture. You should provide whatever you would like the mug to say. We hope this information will be of help to you.